1-1/4" Width is perfect for suits or dress slacks as well as your jeans or Dockers. I own 6 of these belts! A great belt that never, and I mean NEVER, lets you down. I have 6 of these belts in various colors and I love each one. Once they are broken in they fit and function perfectly! I was surprised at how well made the is belt is. Haven't used it yet but I'm sure it will be more than satisfactory. This is the fourth item I have purchased from Tucker Gunleather (second belt). All of the items were of excellent quality and the customer service was right on point. I would not hesitate to recommend Tucker Gunleather to anyone looking for a high quality gun belt or holster. Great belt. Top notch customer service! Tough enough to support your weapon, Narrow enough for dress pants. I purchased the Latigo Canyon Gun Belt in the 1-1/4 width to wear with my dressier pants. I have been using this same belt in 1 1/2" width for over a year with blue jeans and khakis. As with the 1-1/2" belt, the 1-1/4" is top quality in every way. The material is very nice leather, and the finish is superb. I opted for the Brass Buckle, and it is easily as nice as the Dress Belt that I was previously wearing. In addition to the high quality products, Tucker Gun Leather has been fantastic from a service perspective. In my experience, their ship dates have consistently bettered their estimates. The owner is just a phone call away to handle any questions. I am a very satisfied customer. I had a question on the size so I place a phone call and received an immediate response to my question. Later, I placed my order and when I the belt arrived I was very happy. Finally, I have a belt that will support my holster without bending and twisting. Thank you for your customer service and thank you, for the high quality belt. 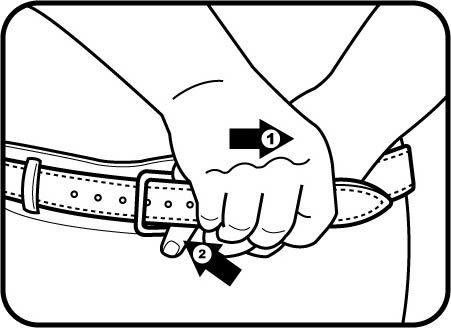 I had the hardest time searching for a gun belt that would pass under even cursory inspection as an everyday dress belt. Large buckles, heavy off-color stitching, rough leather, everything I found had some feature that would make it stand out on a suit. If my belt draws attention, it's defeating the purpose of concealed carry. This belt finally solved that problem. Unless you look close to notice how thick it is, it looks like any other quality dress belt, but it's still strong enough it even supports a fully loaded XDm in an OWB holster. Will definitely be back for another in the future. This belt works great with the larger semi autos and revolvers , it is thick enough to support the weight of a 5" 1911 or a S&W 686. Another great product from Tucker. I will probably need to replace it in about 20 years. I have been a customer for years and every single product I have ever purchased has been of outstanding quality. In particular, the belts are of such high grade and craftsmanship that is unsurpassed anywhere else, even compared to non-gun belts such as Gucci. On top of the quality of the leather and the work, the durability is unparalleled. All this is the reason why I keep coming back to Tucker Gunleather, even after a long hiatus from the gun world.